If you’re on the market for a new toilet, you may be contemplating whether to choose a low flush toilet or a regular flow toilet. In the mid 90s, low flow toilets landed on the market due to water conservation laws. They soon earned a poor reputation among consumers because, at the time, manufacturers abided by the new water rule but failed to change the design of the toilet to remove waste. Since then, low flow toilets undergone lengthy design changes, making them much more of an attractive option than they were years ago. In a low flow toilet, the outlet is located near the center of the bowl while it is located near the back end of the toilet in a regular flow toilet, meaning that less water is used to push waste in the direction of the exit. A second difference between low flow and regular flow toilets is that low flow toilets have more water located near the front of the bowl, which ultimately makes it easier for waste to travel to the outlet since more of the bowl base is submerged in water. 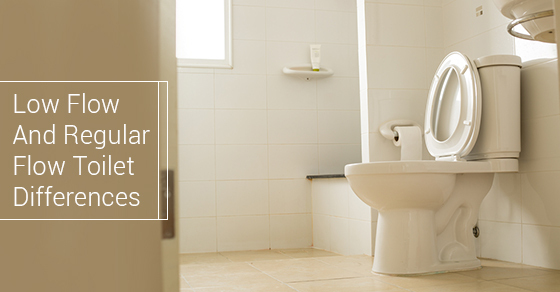 Another difference is their toilet tanks; low flush toilets have a larger flush valve than regular flow toilets. Low flow toilets use less water to remove waste; in order to accomplish the task of removing waste in powerful manner, some low flow toilets may have an additional water supply hole located near the bowl outlet.